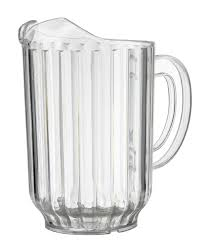 Perfect for any fast-paced bar, restaurant, buffet, or catered event, this pitcher helps provide unmatched beverage service. Use it with beer, soda, punch, water, juice, iced tea, or any number of other chilled beverages. Your servers can carry the pitcher from one spot to the next, or it can be left at the center of a table for easy sharing amongst your thirsty customers.